I don't make our gravy super thick, although, you certainly can if that is how you like it. We also like to eat eggs with our Biscuits and Gravy. ENJOY! Every now and then I MUST have biscuits and gravy for breakfast. It seems lately a lot of blogs that I follow are also sharing their recipes. 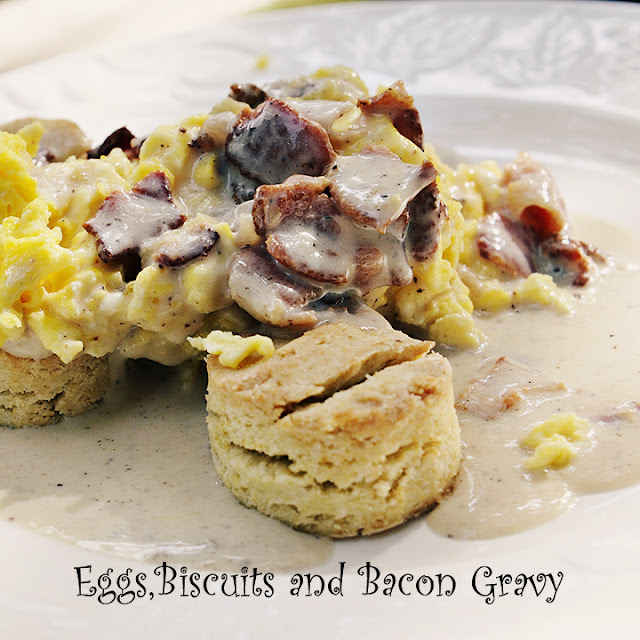 If my tummy is going to be tempted, then I must answer it with a scrumptious biscuit and yummilicious bacon gravy. I like that word, my computer does not know what to do with it...LOL It's a good word...YUM-MI-LIC-IOUS. Just sounds good! I will encourage you to buy great bacon. Don't go for the thin stuff...thick is what you will need. I usually buy my bacon from the deli and spend extra $ for this recipe. Today I used Boars Head. Their stuff is all gluten free. You can use pepper, maple or smoked...it might change the overall flavor a bit, but if your family likes pepper...then buy pepper! Let's make the family happy. I will share with you two recipes for biscuits. One that I LOVE, but cannot eat anymore (wheat). This is the recipe I used to make. I will also share a GF biscuit recipe. 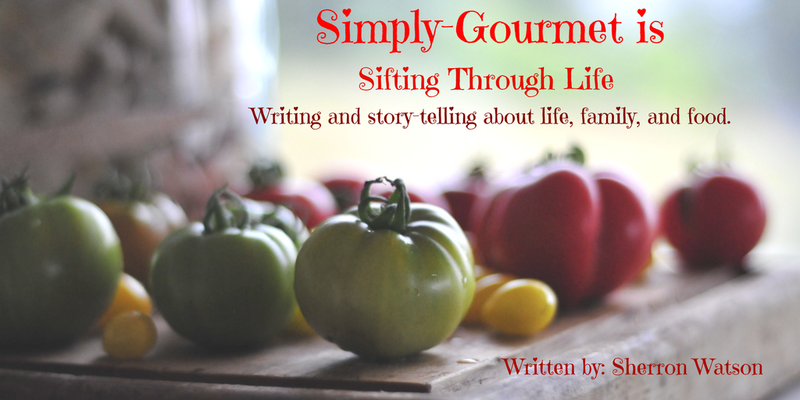 I try really hard to always provide something for everyone in my recipes and something that is GF. I have so many friends that are being diagnosed with Celiac or have a sensitivity to wheat. I am sure that you do to. Let me tell you, that if my friends made something special for me and my diet needs, it almost brings a tear to my eye. It says LOVE when someone WANTS to cook for me, with ME in mind. That is why I share GF recipes and regular recipes. It means a lot to those of us who are on a restricted diet. 1/2 tsp salt. You will need more, but this is a personal choice and you will need to taste and salt as you go. 1/2-1 tsp pepper. We like a lot of pepper. 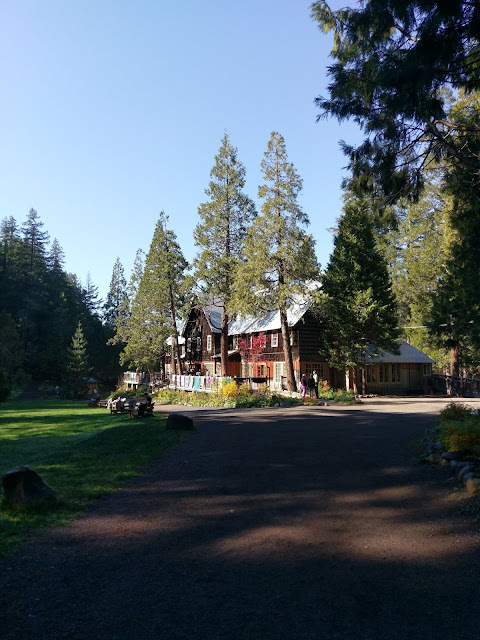 But start small and work up to more. Fry cut bacon in a heavy duty skillet until crisp. I cook my bacon on med to med high heat. I don't like it to burn, so I would rather take it slow and not rush it. When bacon is almost to where you think it is done for your family, add the onion and celery. This combination only needs to cook for about 3-5 minutes. Enough time for them to not be crunchy. Using a slotted spoon, remove bacon/celery/onion mixture to a paper towel. Discard all of the remaining grease except 1 T. bacon grease. If using flour, add flour to grease and cook on med heat for 3 minutes. If using corn starch, add the corn starch to a little bit of the 4 cups of milk and whisk together. Add the milk or starch/milk mixture to the skillet. Using a whisk and watching the heat, stir until bubbly and thick. Add the bacon mixture and turn off the heat. If the gravy is not as thick as you like it add more flour or starch. NOTE: Always add your starch to cold milk or water first, then add to the item you are cooking. I would do the same with flour. It prevents lumps. I like to let the gravy sit for a few minutes so that everything has a chance to meld. 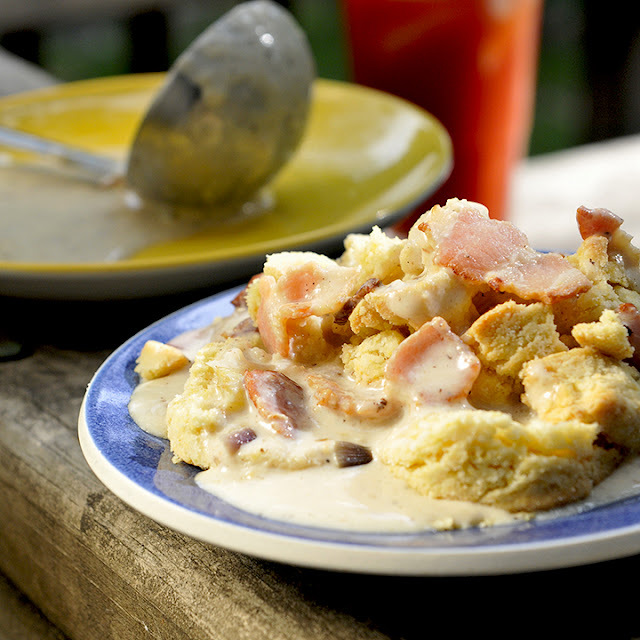 The flavors of the bacon, onion and celery need time to adjust to the flour and milk gravy. This is why I make the gravy first and then make the biscuits. It seems to work out perfectly. OPTIONAL: 1 cup of cheddar cheese...the men love the cheese with the bacon gravy! Combine dry ingredients. Make a well in flour bowl and add milk and broth. Do not over stir. Add cheese and drop dough onto a baking stone or greased cookie sheet. Bake at 450 for 10-12 minutes. The should just start to be turning brown. Every stove is different, so watch them. Optional: 1 cup of grated cheddar cheese. Preheat oven to 425 degrees. Place pizza stone in oven to preheat. You can use a cookie sheet too. In a large bowl combine all of the dry ingredients. Using a whisk, blend dry ingredients well. Add the shortening and butter. Using a pastry cutter, cut into flour until the flour looks like small pebbles. Gently add milk and form dough. Try not to over mix. Using rice flour, sprinkle on to the counter and tip dough out of bowl. I used my fingers to press dough to the thickness I needed my biscuits to be....about 1/2 inch. I used a small circle cutter. Remove stone from oven and place biscuits on stone, return to oven. Bake for 12 minutes. If the biscuits are larger, then you may need to bake them for a little bit longer. I was able to get 40 small biscuits or 16-18 normal size biscuits. Your photos make me want to taste the screen.They look absolutely delicious!I found you from the foodie blog roll and I'd love to guide Foodista readers to your site. I hope you could add this biscuits and gravy widget at the end of this post so we could add you in our list of food bloggers who blogged made this meal,thanks! I've never thought of bacon gravy. I've tried it with ham (I wasn't a fan), but I'll have to try it with bacon now. also have to have eggs with my gravy, whether sausage or chipped beef. I like the gravy on the eggs, too.